Victory - Honor God. Make Disciples. | Gearing up for a Fun Summer! You are here: Home / Gearing up for a Fun Summer! Our KIDS Ministry aims to train the next generation of leaders to honor God and make disciples. We believe that our children are never too young to serve God and be examples to their classmates and friends. Me and my Dad Camp is an opportune time for kids aged six to nine years old to spend two days of roughing it with their dads. Vacation Bible Camp teaches our four- to eight-year-olds important values from God’s Word. It will be an exciting three days of craft-making, storytelling, and games! The Boot Camp trains and equips our preteens (10-12 year olds) to be leaders who would be a positive influence among their peers and communities. The heat is on! 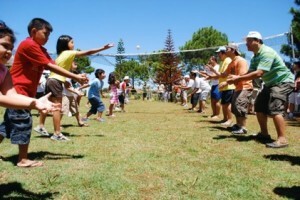 Me and my Dad Camp participants enjoy fun, games, and bonding with their families. “In the summer of 2011, my second child asked her dad to bring her to Me and My Dad Camp. I was really apprehensive about this because Miko, my husband, openly expressed his disapproval about going to church. By God’s grace, Miko agreed to go with my daughter and everything changed since then. During their first night in camp, my daughter called me and said that God answered her prayers because her dad agreed to go to “big church” with me on Sundays. Miko has been actively attending church since then. To my kids, this clearly captured the truth that God answers our prayers. I am blessed that my children know God in a personal level. They’ve grasped that He is very involved in their everyday lives. They are able to pray with so much faith about their concerns. They want to make disciples in their own way. I see the difference in my two small kids who are part of Kids’ Church. Join us at a Victory location nearest you to know more about our KIDS Ministry summer activities! We meet at fifteen venues in Metro Manila and in different provinces across the Philippines. Gear up for an exciting summer with us! when is the VBC and Boot camp? Hi, Kathy! May we know which Victory location you attend? How can my kids join the Boot Camp and how much? Hey, this is Gwen! When is the next Boot Camp this year?